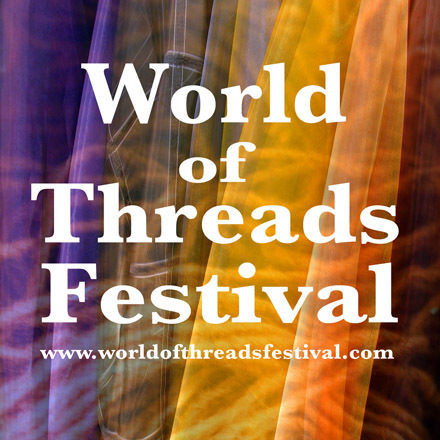 Gareth Bate and Dawne Rudman are curating this 2012 World of Threads exhibition. 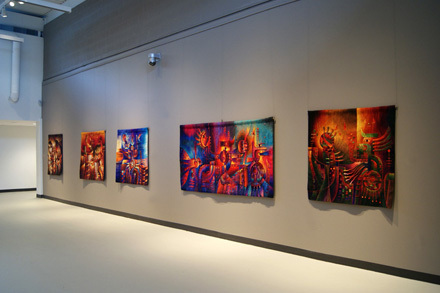 The Display Area at Queen Elizabeth Park Community and Cultural Centre in Oakville, Ontario, Canada. Myth Making brings together three artists from Peru, Canada and the USA whose work is creating a new mythology. Lima, Peru's Maximo Laura's stunning tapestries explore Andean mythology and stories. Peterbough's Faye Jacobs "tree spirit" sculpture combines tree roots with tapestry. 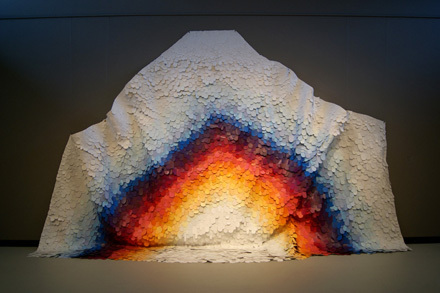 Chicago artist Noel Morical's massive wall hangings made of paint chips give the sense of constructing a universe or cosmic blanket. She will be creating a new piece especially for this exhibition. 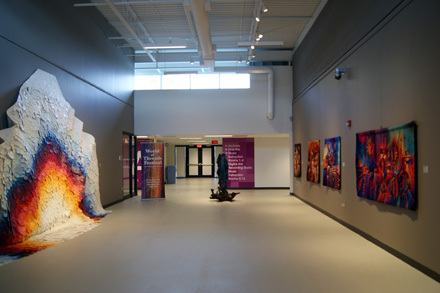 Oakville's newest cultural centre has just opened in April 2012. This large public exhibition space will allow for a spectacular show of large scale installations. Gallery Liaisons: Tonia Di Risio & Preeya Nayee. Exhibition Installers: Gareth Bate, Dawne Rudman, Irene Brayne, Judy Brydon, Lynne Calvert, Preeya Nayee, Tonia DiRisio. Facilities Staff: Julie Ascah, Mike Besic, Lori Coletta, Adrian Duplessis, Susan Fanelli, Tina Field, Chris Fontes, Kamal Fox, Tony Luis, Mitch MacKenzie, Dan Miotto, Don Pearce, Dave Rookyard, Michael Sanserverino, James Schulze, Blake Talbot, Joe La Vergne, John Vidal.